Facial features and physiognomy of people. Features of a face and symbols of i-jing. Pages of website www.emotions.64g.ru within the project about physiognomy represent online gallery of symbolical images according to which types of human faces in profile are systematized by means of 64 hexagrams of the Chinese Book of Changes, namely facial features are compared to lines in hexagrams of i-jing. According to images in online gallery it is possible to see variants or 64 types of human faces, that allows to describe characters of people according to parities of facial features with symbols of i-jing in a context of physiognomy. And also it allows to speak about positive or negative mutual relationships of people according to positions of 64 physiognomic types of human faces in circular schemes where images of facial features are interconnected by geometrical parities and correspond to positions of 64 i-jing symbols in the magic square. Also website shows nine-level physiognomic system according to which features of facial profiles have nine psychological meanings in three spheres of a human face, namely in spheres of consciousness, individuality, feelings. That corresponds to outlines of lips, or facial shapes of a nose, or formal parameters of other features of human half-faces in a context of physiognomy. Physiognomy of psychological spheres of human personality. Facial features and concepts of philosophy. Also pages of website www.emotions.64g.ru consider physiognomy in view of various philosophical concepts which are comparable to three spheres of human personality and facial lineaments or features of a half face. Three foundations and five constancies (san gan wu chan) of the Chinese numerology, and also hierarchical norms of relationships and five moral qualities of the Chinese Confucian philosophy are compared to physiognomy of facial features in spheres of consciousness and feelings. Concepts of names (ming) of the Confucian philosophy are compared to physiognomy of nose shapes in sphere of individuality. Principles of consciousness and four elements of the Greek philosophy, and also five material initial potentialities of the Greek mythology are compared to physiognomy of three facial spheres of human personality. Concepts of spirit with soul and body in Christian philosophy, and also similar concepts of Tao Te Ching in the Chinese philosophy of Taoism are shown in view of transcendental and existential and materialistic philosophical systems. Terms and concepts of different schools of the Indian philosophy, and in particular philosophical ideas of Yoga are compared to facial features of a human face in physiognomy. Geometrical proportions in half-faces of people. Physiognomy and figures of correct polygons. 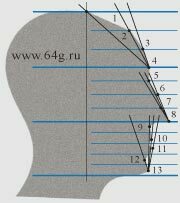 Also pages of website www.emotions.64g.ru show methods for calculations of geometrical proportions in human faces and comparisons of facial shapes with figures of correct polygons in geometry, that allows to speak about objective attributes of beauty and harmony in half-faces of people in view of not only physiognomy, but also aesthetic medicine and cosmetology. In particular pages show the universal physiognomic scale in which unit of measurements allow to calculate facial sizes and geometrical proportions in human faces. 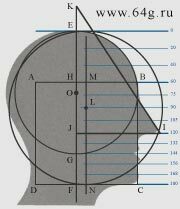 Geometrical ratio of physiognomic reference points and proportions which can be considered as numbers in numerology to speak about physiognomy of facial features in view of numerical values. Pythagorean or otherwise to tell sacred Egyptian triangle which is the key figure of geometrical proportions in features of human faces. Information on geometrical proportions of correct polygons according to which human faces can be harmonious or disharmonious, that allows to calculate beauty of facial shapes by means of comparison with proportions of correct polygons not only in physiognomy, but also in aesthetic medicine and cosmetology. Information on relationships and mutual appeal of people according to ratio of facial shapes with geometrical figures of correct polygons and planets which correspond to geometrical figures in a context of astrology. Examples of geometrical measurements of proportional ratios and formal parameters in faces of people in a context of physiognomy, or in a context of aesthetic medicine and cosmetology that can be necessary before plastic operations and cosmetic procedures. Facial features and signs in horoscopes of people. Physiognomy and astrology of planets. Also website www.emotions.64g.ru shows ratio of astrological planets and signs of zodiac in birth charts and horoscopes of people with facial features. In particular website shows schemes and tables according to which axes of universe correspond with physiognomy of a face within astrological circle. The scale of planetary points according to which facial features correspond to strong and weak planets in signs of zodiac. Projections of facial physiognomy within astrological circle according to the sacred Pythagorean or Egyptian triangle. Ratio of human physiognomy with world elements in structure of astrological circle. Proportions and disproportions of facial features according to aspects of zodiacal signs in astrological circle. Sympathies and antipathies in mutual relationships of people according to ratio of four elements with physiognomy of a face in a context of astrology. Facial features and numerical signs in numerology. Psychological meanings in physiognomy and levels of universe. Also website www.emotions.64g.ru shows ratio of nine numbers in numerology with psychological meanings in features of a human face which is considered as a projection of universe and human personality in a context of physiognomy. In particular numerology of nine numbers and physiognomic facial features are correlated with images of gods in the Greek and Roman mythological systems, and also with deities in the pantheon of Scandinavian mythology and grades of angels in Christian mystical philosophy. Symbols of the Chinese Book of Great Mystery are compared to numerical signs on decimal system of calculations within the magic square of numbers in Pythagorean numerology, and also with psychological meanings of facial features in a context of physiognomy. Subjective and objective notions of people about facial beauty, and also methods which allow to correct subjective perception of beauty by means of measurements of geometrical proportions in faces of people in a context of physiognomy. I hope that information data on geometrical proportions and beauty of a human face, on ratio of facial features with images of mythological gods and concepts of philosophical systems, about interrelations of physiognomy with astrology and numerology will be interesting. Website www.emotions.64g.ru on the portal www.64g.ru is open or otherwise to tell free-of-charge, but all you should make payment, as you pay for books in bookshops. Or it is possible to replace payment by one direct hyperlink in the Internet with this my site. Or I shall be grateful if you will make for me free-of-charge and gratuitous translations of this website pages into any foreign languages.